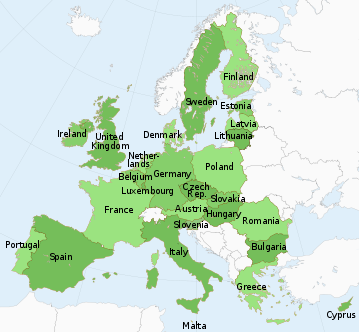 The European Union (EU) is an economic and political union of 27 member states which are located primarily in Europe. Committed to regional integration, the EU was established by the Treaty of Maastricht in 1993 upon the foundations of the European Communities. With over 500 million citizens, the EU generated an estimated 28% share (US$ 16.5 trillion) of the nominal and about 21% (US$14.8 trillion) of the PPP gross world product in 2009. The EU has developed a single market through a standardised system of laws which apply in all member states, and ensures the free movement of people, goods, services, and capital, including the abolition of passport controls by the Schengen Agreement between 22 EU states. It enacts legislation in justice and home affairs, and maintains common policies on trade, agriculture, fisheries and regional development. Sixteen member states have adopted a common currency, the euro, constituting the eurozone. The EU has placed a major emphasis on also developing a co-ordinated approach to education and training. "Education and Training 2010" was the name given by the European Commission to the activities it supports which pursue the agenda set out in the 2001 report of European Ministers of Education to the Spring 2001 European Council, and in their 2002 joint work programme with the Commission. It functions under the Open Method of Coordination and involves exchanges of experience and good practice, joint policy development, benchmarking and measurement of progress. This has now been continued in the form of a new strategic framework for European cooperation in education and training "ET 2020" which develops and reaffirms the EC committment to lifelong learning. The term ‘Learning Region’ is commonplace in the lifelong learning debate. This is logical - they are a key plank of EC policy - places where lifelong learning is implemented. The EC definition is 'A city, town or region which recognises and understands the key role of learning in the development of prosperity, stability and personal fulfilment, and mobilises all its resources creatively to develop the full human potential of all its citizens.’ These resources include both people and organisations - VET, HEIs, SME's, local authorities, schools and adulted, all key stakeholders in a learning region. EUROlocal reinforces the EC policy on lifelong learning regions by collecting the tools, strategies, learning materials, reports and everything concerned with the development of learning regions; putting them together here in this website for all regions to access; and actively marketing the qualitative benefits of becoming a European learning region. 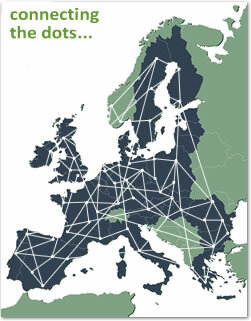 Its workshops promote trans-European cooperation. The following sections provide summaries of the progress of each EU country towards the goals of ET 2020, addressing learning region development and providing links through to more detailed materials included on this website.